Nanci France-Vaz is a modern romantic realist that fuses classical and contemporary realism. The artist’s cinematic style incorporates her acting/dance background into her narrative paintings, which evoke human presence. 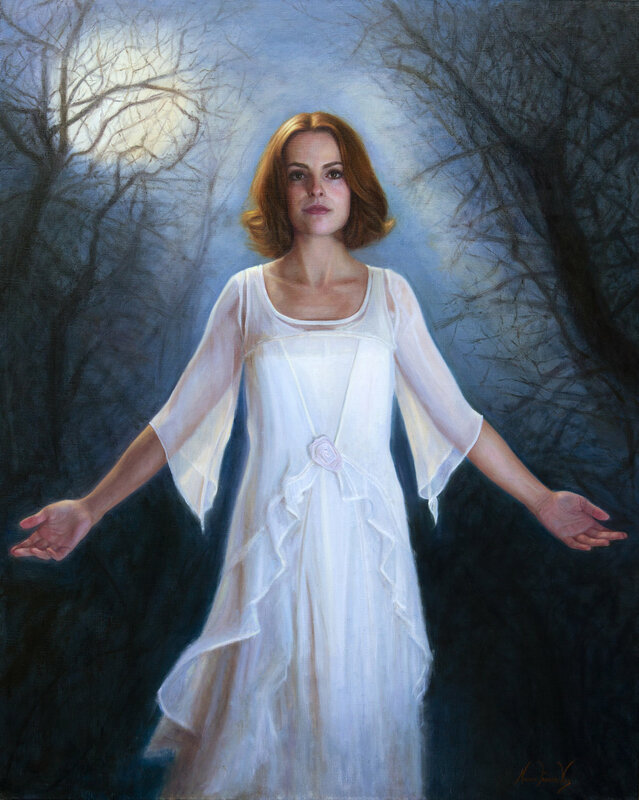 Her awards include the Len G. Everett Memorial Award, International ARC Salon 2011, 2012, 2016, 2017 portrait/figurative finalist, Colonel George J. Morales Award, the John Collins Memorial Award, and 3rd place for Portrait Society of America Members Showcase Exhibition. Ms. France-Vaz painting of Lloyd Price was accepted into the permanent collection of the Rock and Roll Hall of Fame. Her paintings hang in private collections. What concept or narrative is behind the painting Broken Ferris Wheel? “Broken Ferris Wheel” is a song written by my model, singer/songwriter/musician Laura Crisci. She has her own professional band of 20 years with former Springsteen member Danny Federici, and Bob Bandiera and Tico Torres of Bon Jovi. I met her through a friend and listened to her song “Broken Ferris Wheel” and loved it. When we got together for this piece, she expressed to me how she put her life on hold to raise two children down in Nashville. After 20 years, she wanted to pick up where she left off. This is Laura’s story about a failed love. She was on a Ferris wheel ride that was breaking down and wanted to get off the ride. Her outfit is what she wears to concerts, so it is authentically her! The ticket is really a business card that reads Admit One. The meaning is, "I want to leave that ride in the past, and enter the present world of my music business." The Ferris wheel is distorted and out of perspective behind her. The unfinished soft focus means that there are no details left of the past, just the present. It ranges between $2500 and $18000, depending on the size—which is usually 12”×12” to 40”×60”—and the complexity. Yes. Portraits North was my first gallery and Swain’s has been representing me for 2 years. I am seeking new representation nationally and internationally. My statement comes from the passion in my heart and my love for film. Storytelling was one of my first art forms. I wrote short stories at age 9 and acted in drama classes. I love acting and film because everyone is a team player to produce the story. My thesis at SVA was a short film. My ideas are usually a concept of spiritual thoughts. It is the narrative, the light, and the person I portray in the environment. It is their story or my story about a moment in life and depth to the human character that breath a life on canvas. In all my work, I fuse the classical with the contemporary. I do not believe Rembrandt would not use technology and only 4 colors if he were alive today. If we continue with copycat behavior by stealing from the masters past and living as the only source of creativity, we are doomed. My belief is that is what destroyed the Academies in the early 20th century. To be so purist to only paint from life and never capture a moment or use the imagination is a sure way to fade away. Sometimes 2 days, sometimes 2 months, depending on the size and complexity, and inspiration from my model. I do not suffer from artist's block…I have too many ideas…creative ADD. Once I have my “story,” I start with the photo-shoot and then go into Photoshop to create layers with imaginative environments. I can usually go back out into an environment and wait for the same type of lighting situation to gather more reference. That can take a week just to do the comps and design. Many times, I am using my own body and imagination of the figure or pattern, never being a slave to the photo! It all happens from a dream, or while I am doing yoga, biking, etc. I get into a zone. It happens very quickly in my head, and then I am off! I hope to make people FEEL my work. Feeling is lacking today, isn’t it? Everyone is socially inept, self-centered, or angry. I hope my paintings speak volumes to the masses about the human condition, the soul, and the imagination of what is and what is possible. We can’t be slaves to mediocrity because it sells. I never want to be that. I learned that to express your emotions, concepts, and authenticity is much more rewarding than being the next one-hit wonder! All the time! I hate routines and one way of doing anything. My favorite painter is Vincent Desiderio…so unconventional. I would say that is my personality—willing to just jump in and try. Failing is good for the soul if you evolve enough to realize that is how you lose FEAR, and the ego to progress forward from a lesson learned! I never start a painting on the same surface or the same way. It all depends. Kristy Gordon, Teresa Oaxaca, Jennifer Balkan, Karen Offutt, Rachel Moseley, Stephanie Deshpande, Terry Strickland, Nancy Depew, Shana Levenson, Ellen Eagle, Nanette Fluhr, Gregory Mortenson, and Ricky Mujica. I always wanted to be a painter, so when I left, I started painting seriously with Dan Thompson, Michael Grimaldi, Nelson Shanks, and Paul McCormack, and a workshop with Casey Baugh. I have sold 6 this year and a couple of portrait commissions from private clients.